The Evo FX2 treadmill is the cheapest model in the Evo lineup. And since it is the cheapest, expect it to lack some useful features including the patented motion control which is the primary reason why people buy an Evo. If you’re looking for a decent low to mid priced treadmill with a solid feel and long warranties, then this is the unit for you. It is most fitting to soft runners and jogger alike. But before you buy, you might also want to know that Smooth Fitness(the manufacturer of this treadmill) also has a Smooth 5.15P treadmill, which is similar to the Evo FX2 but is cheaper and provides better value. Also, this machine doesn’t offer the patented motion control feature. So if you want a motion control treadmill, then the Evo FX40HR is a better choice for you. The Evo FX2 treadmill offers a 2.5HP continuous duty motor which is capable of delivering speeds of up to 10mph and has 12 levels of incline. This motor along with the 7 challenging preset workouts provide you the power and variety that you need to get an effective workout. The handrail pulse grip monitor of this unit enables you to workout in your target heart rate zone for a more efficient exercise. Not only that, the easy to read LCD window will show you your calories/levels, time, pulse, distance simultaneously (No toggling required) so you’ll always keep track of your progress. And finally, this treadmill comes with decent warranties. It has a warranty of 10 years for the motor, 5 years for the belt/deck/rollers, 3 years for parts, one year for labor and a lifetime for frame. The biggest weakness of this machine is that it doesn’t offer the motion control. 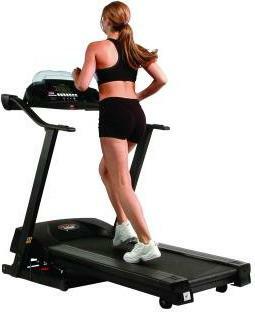 It is the feature that made Evo treadmills famous. And without it, this is just another ordinary treadmill. Without the famous motion control, I don’t see any reason why you should buy this model. You’ll be better off buying other Smooth Fitness’ treadmills. (May I suggest the cheaper but better Smooth 5.15P treadmill) So to conclude I don’t recommend the Evo FX2 treadmill. If you plan on buying an Evo FX2 treadmill, I suggest you buy it at Evofitness. They offer the best price around the net. You can get it for just $1,099.